So, it’s been awhile since we’ve had a new release from Visions Of Atlantis. The last one being Ethera in 2013, with a different line up. 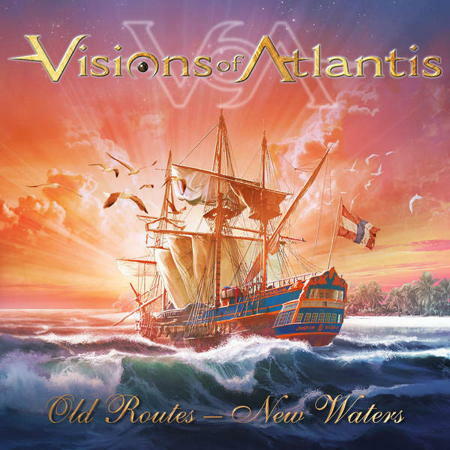 In the meantime the only original member Thomas Caser has formed a new Visions of Atlantis, sort of. He has brought back fellow originals, Michael Koren on bass, Werner Fiedler on guitars and Chris Kamper on keyboards. However the new singers in band are interesting choices. Clémentine Delauney (formally from Serenity) and Siegfried Samer (from Dragony). This change up in dynamic has proven pretty popular as they have toured extensively and have generally received positive acclaim. The new EP Old Routes - New Waters symbolises the return for the band and what a way to kick yourselves back into gear. With reworking of old classics. It’s everything that I wanted in a Visions Of Atlantis record. Big, bold, with epic qualities and catchy melodies. The production is nice and it makes everything sound bold and polished. All of the elements of the band shine really well. Gone is the more synthetic tones of Ethera, and in are the more traditional symphonic metal sounds that you’d expect from this music. It all screams of ‘playing it safe’. However I don’t see this a downside, more of a return to form. The themes and imagery of fantasy and adventure are very welcome indeed giving some depth to the songs and again, adds to those epic qualities. Although the EP is only five tracks long Visions Of Atlantis make the most of every single second with clear production and sharp songwriting that has a real punch. From the riff popping sounds on Lovebearing Storm and Lost to the sweeter ballads like Winternight, the EP is filled to the brim with imagination and content. The softness of the keyboards and synth, both mesh with and counter, the harshness of the guitars beautifully. Making for a genuinely dynamic and fun sound. It feels very familiar but new at the same time. Even though I’ve heard a lot of music like this, Visions Of Atlantis have brought something new to the table brings me back to falling in love with the band all over again. To be honest, I got very emotional listening to this EP, and this band again. Visions Of Atlantis were one of my Dad’s favourite bands. I remember him getting all of their records and listening to them with glee. Since my Dad passed a few years ago, I have not actually listened to the band at all. Getting the chance to hear the newly reformed band was something I didn’t want to pass up. I think that my dad would have loved this new EP. The songs nearly brought me to tear, particularly Last Shut Of Your Eyes. As I know he would have loved the sound. He always liked the soft gentle sounds crash against the heavy metal. That’s probably the biggest compliment I could pay to the EP. Clémentine and Siegfried share a brilliant chemistry that really sounds great and the band as a whole are well gelled and sound fantastic together. I am loving the new EP and it is well worth checking out, in my opinion at least.